If you don’t know what fascia boards are, well, they’re basically the flat horizontal boards that run along your roof’s edge. This type of board is used for attaching soffit panels beneath the eaves and gutters to the roof. So if you plan on installing new vinyl siding on your house, you can consider installing vinyl trim on the fascia. As for the purpose of the trim, it protects the fascia board from harsh weather and also makes your roof look better. The first step you should take involves removing the gutter from the fascia where you plan to install the trim. Remove the gutter from the downspout if there is one and make sure that you then proceed with unscrewing the lag bolts holding the gutter to the fascia. If you want to use it again, the gutter should be handled with care, preferably by two people . If there’s no gutter on the board, the undersill trim should be nailed to the top of the fascia board. Next, the undersill trim needs to be positioned against the fascia board. Next, every three feet along the fascia’s length you should consider driving 4d galvanized nails. However, skip this step if there’s a gutter mounted on the fascia board. An F-channel should now be nailed to the fascia board’s bottom side. 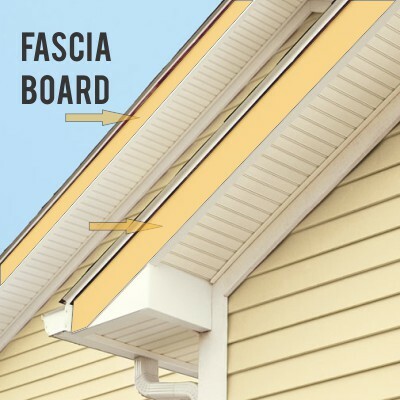 The F-channel needs to be placed face down against the fascia’s bottom while making sure that the slot faces towards the house. At every three feet, galvanized nails need to be driven through the slots on the F-channel and then into the fascia. Carefully assess the distance between the top of the slot in the undersill trim, but also between the top and the bottom edge of the F-channel and then proceed with subtracting a quarter of an inch. In order to make sure the fascia trim fits this width, cut it using the table saw. Use a snap lock punch for punching tabs into the top of the fascia trim. The holes should be placed an eighth of an inch underneath the trim’s top edge and make sure to punch 1 tab every six inches. The fascia trim should now be carefully lifted into position. At this point, the curled edge along the fascia’s bottom trim should be hook into the F channel’s channel. After that, the fascia trim’s top edge should be tucked into the undersill trim or gutter apron. The edges of adjoining pieces should next be overlapped by one and a half inches. For the fascia trim you’ll now need to consider fabricating corner pieces. A piece of fascia trim should then be cut to a width of twelve inches. Drawn a line down the trim’s center (vertical) on the interior edge. Use a pair of tin snips for cutting a notch in the lip along the trim’s bottom edge. On each side, the notch needs to be cut at a forty five degree angle in order to create a ninety degree angle when folding the trim. While holding a straightedge in toe notch’s center the trim should be folded into a right angle piece. Follow by punching tabs into the corner piece’s top and use a tab in the middle of each side. Use the same method you used for installing the other fascia trim to install the corner pieces not the fascia board. If you had a gutter, make sure to reinstall it with a proper slope and adequately secured to your newly installed fascia board or beneath the edge of roof covering.